The FoodSaver V3240 (V3200 Series) Vacuum Sealing System will keep your food fresh up to five times longer than ordinary storage methods. Prevent that nasty freezer burn and get your food tasting like you just bought it yesterday. This system removes air and moisture from specially-designed, multi-layer bags while sealing in flavor so that your food tastes good and fresh even after being in the freezer for months. Get organized with meal planning to free up your time for more important things. Use it to portion and freeze pre-made dinners that you can reheat during the week. It is a great way to keep left over salad or pizza slices in the fridge for later, to deep-freeze cuts of meat, and so much more. You will save money by not having to throw away freezer burned meat, produce and those leftovers your forgot about. 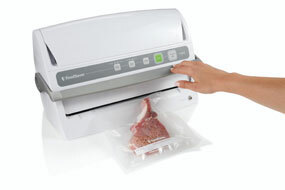 The V3240 is compact, easy to use and has so many practical uses in addition to keeping your food fresh longer. This user-friendly machine has an easy to understand control panel and saves countertop space with its convenient vertical design. Speed Settings Adjusts vacuum speed based on food type. Moist/Dry Food Settings to adjust seal level based on dry or moist food. Roll Storage The built-in roll holder stores a FoodSaver Roll for added convenience. Sealing Strip The extra wide sealing strip applies heat for a secure, air-tight seal that locks in the freshness and flavor of food. Removable Drip Tray The dishwasher-safe, extra wide drip tray helps to catch the overflow of liquids. Accessory Port and Hose Included hose allows you to seal in freshness with all FoodSaver Containers and Canisters. Store your favorite foods properly to avoid waste. Vacuum-sealed fish can last up to two years and vegetables can last two to three years when stored in the freezer. Take a look at the chart below for other items to keep fresh longer with your FoodSaver. 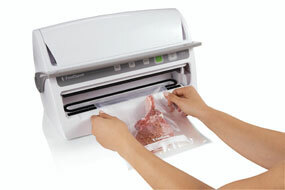 Vacuum sealers for food are a great addition to any kitchen. 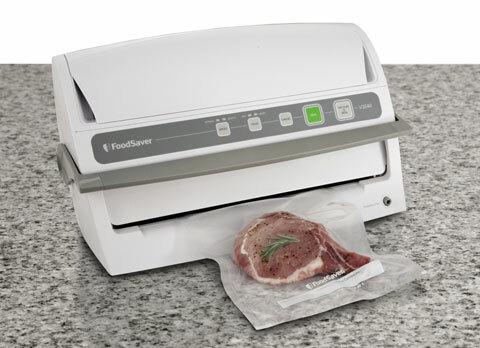 Get organized with your meal planning and save money by using the FoodSaver V3240 (V3200 Series) Vacuum Sealing System. Buy quality, it saves you in the long run. Excellent product We bought this food saver after the one we had for several years finally died. We chose this model mainly because of the wider seal. Since we purchased it about 6 months ago we have used it fairly frequently and it has worked very well. We belong to a warehouse store and buy hamburger and chicken in bulk. After getting it home we divide them up into more manageable sizes and seal them up with the food saver before freezing them. This has saved us quite a bit of money over the years. Another thing that we do, since we live in wisconsin is to grill a large amount of hamburgers and chicken breasts in the fall, seal them and freeze them. We can then enjoy them over the winter without having to drag the grill out of a snow bank. Very happy with this item.P.S. don’t bother with the pre made bag, get the roll and make them yourself, FAR more economical. Every feature needed for painless vacuum sealing! I did extensive research before purchasing this unit. 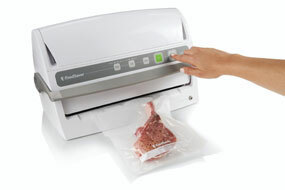 I watched videos and demos of many different brands and types of vacuum sealers. I compared the features required for what foods I wanted to store. This unit is a complete featured machine. It has preformed flawlessly since day one. I no longer throw out freezer burnt food. I like that it has a moist/Dry setting. You can also seal without vacuum. You can stop the vacuum process at the stage you want and seal immediatly (like for muffins, etc). This unit is so powerful it will crush an empty soda can. If you buy a lower end sealer, you will get what you pay for and then kick yourself for not buying a better machine that will work for any food situation. This machine has paid for itself already. Everyone should own one. This one. This is the One I don’t entirely buy into the money saving angle of this appliance, but Mrs. Spudman loves these things and her old one had lost its magic. Thus I went on the hunt for a new one. 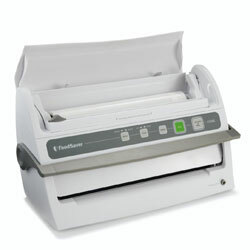 After some extensive review reading, I narrowed down my choices to the snazzy looking red V2840 FoodSaver and this one. I ultimately chose the V3240 because it seems to be a newer model.